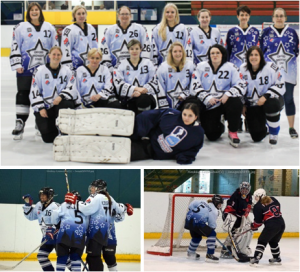 The Oxford Midnight Stars are a UK women’s ice hockey team competing in the EIHA Division 1 South league. They train all year round at the Oxford ice rink every Friday night from 11pm to midnight. All ages welcome (although you must be 15 or over to compete in league matches). If you are looking for a new team, have just moved into the area please do get in touch – they’d love to hear from you!